Call of Chernobyl is a free-play sandbox mod for S.T.A.L.K.E.R. : Call of Pripyat created by TeamEPIC. It features 32 explorable maps, reworked level design and level fixes, new original level, Trucks Cemetery, Full AI and A-Life overhaul, engine and script enhancements, Repeatable task system which bases itself on A-Life events, Customizable weather environments for every map as well as surges and psi-storms from AF3, Character creation which includes name, portrait and faction selection; Several optional modes such as Ironman mode, story mode and zombie survival mode, New achievements, rankings and reputation system, PDA leaderboard and enhanced PDA statistics, Companion system with keyboard issued commands, many optional side-features and community-made addons . Call of Chernobyl was player's choice Mod of the Year 9th place in 2015 and 1st place in 2016! Report RSS	Call of Chernobyl 1.4 released! The long awaited 1.4 patch for the S.T.A.L.K.E.R. : Call of Chernobyl modification has been released. Many new features, customizations and optimizations have made their way into the mod; such as new achievements, player statistics, top 100 stalker leaderboard, optional artefact degradation, story mode and more! The long awaited patch for Call of Chernobyl is finally here. The mod has seen a tremendous amount of growth and change since 1.3.2; we have been working hard this year to bring the stalker community this new content in the form of the 1.4 update. This patch contains so many changes it would be rather difficult to go through that list here but below is a brief overview. One of the first things to notice when firing up 1.4 are the changes to the PDA statistics screen. Many new stats are tracked and a portion of screen real estate is now dedicated to the top 100 leaderboard. Climb to the top of the leaderboard by increasing rank in-game and by being the stalker you were always meant to be. Hovering the cursor over other stalkers in the list may bring up their statistics but only after they have been encountered on the same map. 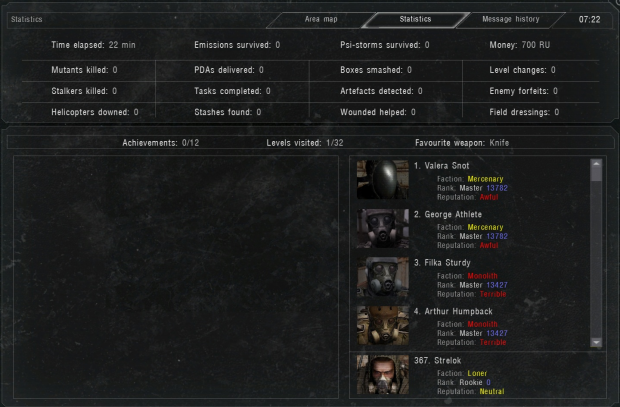 Not only has the statistics screen seen an overhaul, but a new array of achievements have been added. It's now possible to select from a broad array of faction-specific starting location. Additionally, the ability to select a character portrait has been added alongside a new game option to display a portrait that closely matches the equipped outfit. If you thought that was all, we added an optional story mode feature which can be toggled during character creation. It has a light dialog-driven focus and includes multiple endings. The task starts with a simple puzzle to find Doc and takes you on a journey throughout many of the game levels to discover the mysteries of the Zone. Underground labs have been populated with all sorts of creatures. Now mutants can only be found during specific times of the day depending on their behavior type. Night predators like Chimeras, cats and snorks can now only be seen at night. Day time mutants like boar and flesh can only be seen during the day. However, these mutants can always be found in underground labs or during tasks regardless of time of day. Offline A-Life is now much more active and more willing to travel to far off levels. 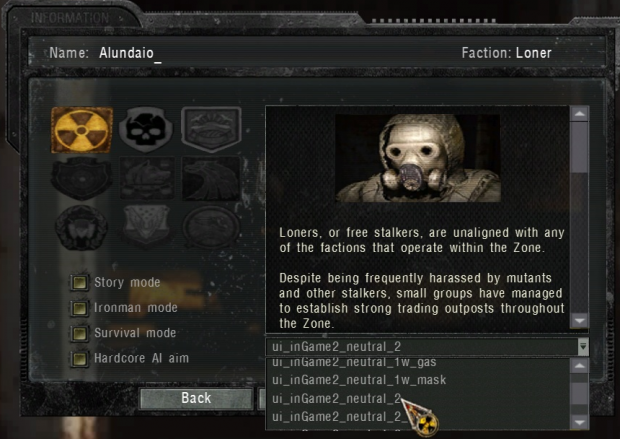 A new game options allows the player to control the population of the Zone, by reducing or increase stalker or mutant spawns based on a multiplier. Online exclusion radius is a feature added to gameplay options that blocks A-Life spawning in the player's immediate area and can be adjusted or disabled. Artefacts can now degrade when their abilities and bonuses are activated. Degradation decreases the overall impact of both the bonuses and negative effects. Degradation is communicated in-game through the new Efficiency stat. Degradation promotes further artefact hunting and accumulation. In some cases stashing artefacts might be a wiser decision over cashing them in. Having the best artefacts no longer is the end of the line for artefact hunting. 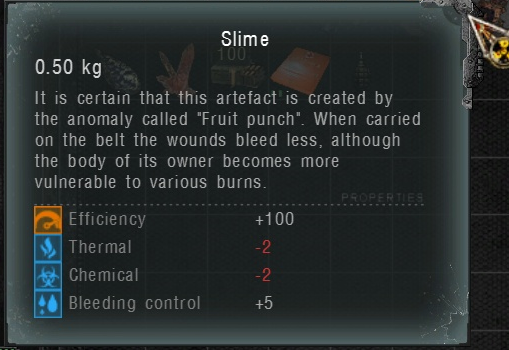 Artefact bonuses have been slightly boosted to help balance this feature. I would have liked to make protection artefacts give huge boosts to damage types and give them high degradation rates, but since this feature is optional that can't occur. Perhaps addons will expand on this idea further. Now it's possible to visually equip knives, binoculars and grenades directly in the inventory menu. The non-slottable equippable items will be highlighted and will allow the ability to equip/unequip them via the context menu. This feature should open up new addon possibilities like tiered binoculars or new melee weapons. New base defense events have been added to the game. During late night and early hours of the morning in several faction-specific bases, there is a chance swarms of mutants will attack a base. 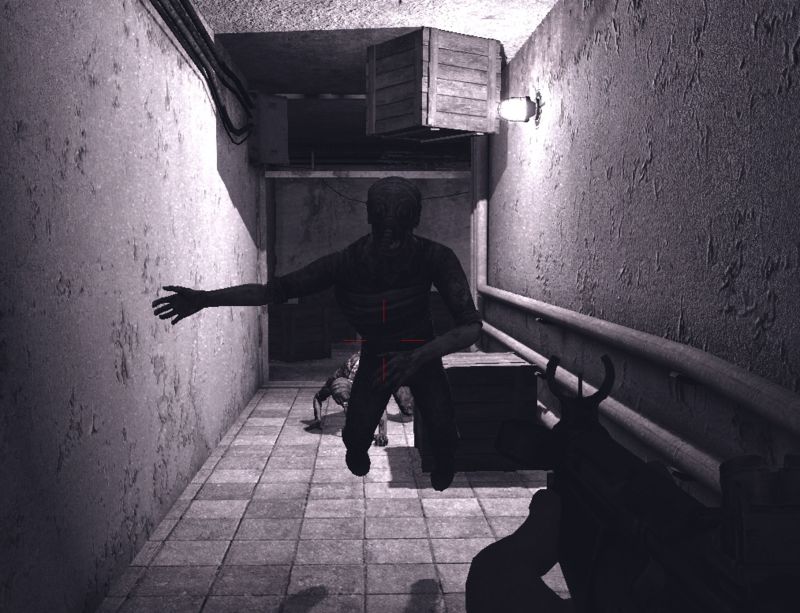 Furthermore, emissions sometimes cause zombified stalkers and mutants to swarm the bunker leaving it up to you to stop them, optionally with the help of a stationary machine gun on top of the bunker. The arena has returned to Rostok. It is now possible to compete in two different arena types, the one everyone is familiar with from Shadow of Chernobyl and a cut version that exists in build 2571. Compete to win cash rewards as well as notoriety. Equipment upgrade display has had an overhaul. The display bonuses are now more accurate and based on the real mathematical formulas. This gives a much better sense of what an upgrade is actually going to do. Cut outfit protections, strike and explosion protections have be restored and have been included in many of the existing upgrades. You can now change FOV and Hud FOV directly from game options via a slider instead of using developer console. A slider for Grass Render Distance is now available in the advanced video options. Happy Anniversary Call of Chernobyl! It's one year since we released Call of Chernobyl publicly as version 1.2. Thanks guys for all the support and making Call of Chernobyl one of the best mods for Call of Pripyat! I am stocked to venture into the zone once more. Thanks for all the hard work mates, I must say that CoC is amonst the best mods in my book, definitely in the top 3! Hehe. I am in love with it. Thanks again. Whats stcop and did you merge theses mods manualy or with a mod merger? I think they should be integrated into the main mod. Or at least the extra weapons added, and even modified to stay in style with the default download? Why didnt the freedumb armory door get fixed? What kind of glitch is it anyway? Because it was an inside joke. Originally long ago these had no doors and testers complained how easy it was to get all the loot. So we locked the doors and put hidden mines in them, so when someone glitches the door open they blow up and we laugh. Fine, I'll get the Bulldog the hard way then! This mod has come such a long way. Really fantastic work from the entire team and their collaborators. CoC seems like the ultimate STALKER game, feature-wise. I hope now more people will use this as a base for their mods. Thank you so much for this mod and addons! YAY! So excited! Are weapon addons compatible with HUD FOV slider? Amazing new features!! Can't wait to play this. Make sure you didn't turn grass settings on max. Ok it worked, i haved grass on max so i reduced it to half and now is working, THX, We finally spawn with Primary Weapons, Debug mode words are finally gone, Map is better, And I have question. Is Absolute Nature 4 in the mod? No, AN4 is not in the mod, because what exactly would we put in it? There are like 8 different texture sets and many people still prefer the vanilla look. So, it's better just to leave it as a separate thing. This is awesome, thanks for putting in all the hard work guys! You guys have gone above and beyond the call of duty with CoC. Most AAA devs don't support their games this well! I was litterally 3 days of work away from combining 1.3.2 and AO3. Thank you, TeamEPIC. You guys are amazing. LOL i found a glitch, i haved a Psi Storm when Emission started and some seconds before Emission Boom, Psi Storm ended and Psi storm red skies dissapeared and there was still a emission and sky was clear. Its bundles Absolute Nature 4 or any plans of merge pack? Congratulations ... This MOD is a great job. how do i unpack the files so i can mod them? i cant stand jogging through the zone pm me. I just want to let ya all know that i am getting a windows smart screen message when i attempt to launch Coc+ 1.4, This does not happen with previous CoC patches. This has happened with some non english, unreleased mods once or twice in the past. How did you download 1.4? If stalker-coc.exe is unrecognizable it could be you have old version of 7-zip? It says in the description on the old unpacker and in the comment section where to find a new tool. Is the weapon duplicating error fixed while removing scopes which was in beta? Also, does auto-updater work or I have to download this? 1.4 is a repack of the mod it's not a patch. CoCdater has been retired for now. For hour-long update times and being a useful resource for seeing if there were any new patches when I launched the game....I salute you. Hi! I love this version, but population is still low even when i adjusted it. I used debug menu, tried to spawn squads but i cant pick location where the squad will spawn. There is just nothing to choose. In previous version i could do that. There is absolutely no way population is too low. There are still underpopulated places. And add too much squad will decrease ingame performance. i agree with M0S1N it dosent matter wich settign i have on i have meet 2 freedom guys marching from yanov to army warehouse and not another soul a few mutants though like 2-3 chimeras 4 "biggies" and like 20-30 fleshies and boars but only 2 statlkers i mean? wtf?